[T]he Trump Administration is now prepared to accept President Bashar al-Assad’s continued rule until Syria’s next scheduled Presidential election, in 2021, according to U.S. and European officials. The decision reverses repeated U.S. statements that Assad must step down as part of a peace process. The Trump Administration says it still wants a political process that holds the prospect of Assad’s departure. But it has concluded that it may take until 2021, when the next election is scheduled, to pull it off. U.S. officials worry that Assad could win the 2021 Syrian election, one way or the other, and remain in power for years to come. The U.S. "lets Assad stay" because there is simply nothing else it can do without waging a large scale war. It has tried everything else - and lost. In 2012 it attempted to assassinate Assad, but he wasn't at the security meeting that the CIA blew up. It send 100,000 Takfiri fighters from all over the world to Syria and shipped in ten-thousands of tons of weapons and ammunition. The global anti-Syrian propaganda campaign in favor of the Takfiris was unprecedented. It tried to build a political opposition and sponsored it with hundreds of millions. It lastly invaded the country and tried to split it by force. It failed on all fronts. The Syrian opposition groups backed by the United States have been ineffectual. They have squabbled among themselves and split into factions. Diplomatically, Washington has been marginalized by the powerful troika of Russia, Iran, and Turkey, which now dominates the peace process. In 2013 the author of the piece, Robin Wright, presented the Israeli dream of a split up Middle East. It was a remake of the "Blood Borders" map peddled in 2006 by the neoconservatives Col. Ralph Peters. 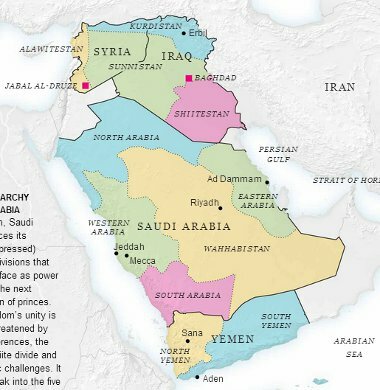 That gain was an updated version of a map of a "New Middle East" by Bernhard Lewis published in Foreign Affairs. Those maps went into the trash-bin when the U.S. had to leave Iraq. Wrigth's cartographic expression of imperial arrogance will end there too. Wright is heavily wired in Washington. She is part of the *borg* and held/holds positions at the U.S. Institute of Peace (which plans wars), the Wilson Center, Brookings and Carnegie Endowment. That she has now given up on her ludicrous map likely reflects the leading opinions within those institutions. Col. John Thomas, spokesman for the US Central Command (CENTCOM), said that the international coalition forces would remain in Syria to support the operations of the Arab-Kurdish “Syrian Democratic Forces” until the conclusion of negotiations on a political solution in Geneva. Mr Nasrallah called on the “resistance axis” — a reference to Hizbollah and its Syrian and Iranian allies and patrons — to “devote all its power and time to the Palestinians. I call on all the resistance factions in the region to unite and put one common strategy and practical plan to face this threat,” he said. It was Israel that was behind (pdf) the campaign to dismantle Syria and Iraq. It utterly failed and the revenge will be harsh. Hizbullah is better armed and trained than ever. Battle experienced Iraqi and Iranian groups stand ready. The Syrian army is much better trained and equipped than before the war. The Iraqi resistance leader Qais Al Khazali recently visited south-Lebanon and took a look over the border into Israel. He was surveying the new battlefield. Israel's great new alliance with Saudi Arabia has not helped its position. The Salman tyrant and his son are in an insecure position and their great relations with Trump have tanked, allegedly over the issue of Jerusalem. The Israeli Prime Minister Netanyahoo is under pressure at home. The corruption accusation accumulate and his time in office is now limited. Who will replace him? What is the new plan the Zionists will come up with to react to the changed situation?